In the spirit of getting back to work slowly this week, we thought it would be a good idea to catch you up on everything 2017 in local news. Sure, there are a long list of reasons to forget what was objectively a terrible year but “Those who cannot remember the past are condemned to repeat it”, and all that. So, if you want to know what some of the major newsmakers thought about 2017, and what stories topped the lists of Edmonton newsrooms, we have got you so covered. Everyone got an interview with the mayor to round up their year-in-review coverage. Don Iveson is talking about transit and regional co-operation with Postmedia Edmonton (Journal and Sun) and with CBC Edmonton. Global (Global TV/630CHED/iNews880) radio also has their interview with the mayor, which looks at the pending legalization of marijuana. And Iveson’s year-ender with Metro Edmonton takes a Q+A approach to cover topics including the Metro Line LRT, Accidental Beach and Northlands. Global TV broke their interview into a 6-part series. Part one, part two, part three, part four, part five, part six. I won’t judge you if you don’t watch all six parts. Other mayors around the Metro Region looking back (and a little bit ahead) include St. Albert mayor Cathy Heron, Beaumont mayor John Stewart (who doesn’t talk about regional co-operation, even though Edmonton and Beaumont are fighting over some annexed land), Fort Saskatchewan mayor Gale Katchur and Devon mayor Ray Ralph. The Edmonton Public School Board chair is looking at the year ahead, asking for a slowdown on legislation. The education minister says more change is coming (but maybe a little less in 2018). Next to the mayor, chief Rod Knecht is the most popular choice for a year-end interview. He talked to CBC about the attack from the summer. The challenges of marijuana legalization came up in interviews with Postmedia and the CBC, where he mentioned the force might not be ready for the change. He also had a Q+A with Metro Edmonton and talked more with CBC about considering seeking another term as chief, as well as expanding cyber and economic crime work, and more with Postmedia about homicides through the year, which didn’t have an overall pattern but did include more gun deaths. In that CBC story the chief was thinking about another term, since his current one is up later this year. Postmedia had a similar thought from the chief. But then CTV’s year-ender with Rod Knecht has him willing to call this the last year for him as chief. CTV was last to air, so I guess we hedge our bets that we might be looking for a new chief. Maybe. The head of RCMP K Division talked about a number of changes he brought to Alberta, and the pending marijuana legalization (of course), in his interview with Postmedia. The same papers also had a story from the border guards at the Edmonton airport. Edmonton Fire Rescue Services chief Ken Block sat down for a few interviews, with CBC focusing on preparations for a major emergency, dealing with opioid overdoses and new resources coming in 2018. Corus/Global focused their stories on a new fire station being behind schedule and preparing for large emergencies. How Edmonton is building and expanding also factored into what was on the chief’s mind at the end of the year, particularly Edmonton’s increasing high-rises and tunnels. One of the topics that did keep coming up for Chief Block was opioids. Emergency responders are dealing with a lot of overdoses and that’s put new pressures on firefighters. If you want to refresh yourself on the big stories in Edmonton in 2017, a lot of which will set up stories and issues in 2018, you can also check out roundups from most newsrooms. Postmedia Edmonton has an entire section dedicated to the big and important stories of the year, and all their year-end interviews, and selected stories from reporters, editors and photographers too. If you’re looking for something from last year, you’re going to find it in there. CBC Edmonton has their most-read stories and their most popular. Global has their top 10 stories. CTV did a year-in-review story. And the Edmonton Examiner has a look at some top stories too. CBC and Vue Weekly looked some of the city’s best restaurants and food. Vue looks at the music scene and what was happening in theatre and arts. Gig City also had a look back at arts scandals and related shake-ups in Edmonton arts in 2017. I also think the top stories at Folio, the University of Alberta’s content publisher, are worth checking out. They have their top 10 and also a top five featuring their experts. You’ll have seen a lot of these covered by newsrooms throughout the year. If all of that is still not enough to satisfy your need for looking back at 2017, you can always check our Headlines for almost every single story in Edmonton news from our launch date of February 7, 2017 to the end of the year. Obviously, the election made up a lot of our conversation in the fall. 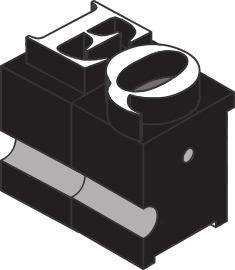 In fact, October was our busiest month here at EQ which is a good reminder how important local news remains. Transit became an issue during the election, particularly the LRT we’re currently planning and the lines we’re yet to start work on. This will continue to be a big story in 2018 as the Valley Line is built to Mill Woods, we keep fighting with the Metro Line and work really starts to roll out on our entirely new transit strategy. The municipal election also gave us a fun mystery to solve. Our challenges around infill housing and density continued, probably highlighted best by an 80-storey tower which should force us to ask questions about what kind of neighbourhoods we’re trying to build, or sustain, in older parts of Edmonton. Even with new rules for mature neighbourhoods last year, more changes are likely to come as we struggle to build up our older communities with more density instead of just continuing to sprawl out. Inclusion and protection of LGBTQ2s+ students was also a big story this year. Locally, it caused a rift at the Edmonton Public School Board right before the election, and it was among many issues the Edmonton Catholic School District had to contend with in a tumultuous year. And we have lost Northlands Coliseum (and almost everything we knew Northlands to do), which leaves a lot of questions, and an empty arena, to contend with. Since we’re talking about our 2017, we’re also going to take a moment to remind you of the feature stories we produced throughout the year. We looked at the inadvertent ways journalists propel racism and hate in Making the Right Call. In Who Will Stop Police Carding, we concluded the year, and many months of covering the issue of police carding and racial profiling, with a look at the most recent history of the issue and a new video of the practice in action. Edmonton’s last city council began adding some mental health and social isolation programming to the budget, and we took at look at an under-funded program in Edmonton’s Benches You Won’t Sit On. In the story Edmonton’s Indigenous Tech Opportunity, we introduced you to Naheyawin, a local business doing a lot to bring reconciliation to Edmonton tech, and business. A Queen Alex mapping workshop. And our story on the volunteer efforts of Queen Alexandra residents, Renewing Community, showcased what they had done to make their community’s streets safer, more walkable and better connectors of the neighbourhood. Future neighbourhood renewals in Edmonton are going to follow this new template. Speaking of Queen Alex… the new episode of Walkcast looks at how those neighbours worked with the City of Edmonton to get changes during their neighbourhood renewal plan. Just a short personal note on 2017. Thanks for sticking with EQ, and me, through our first year! It’s been great to have so many conversations with you about issues in Edmonton. I’m excited to keep that going in 2018 with as many new stories and new content as I can muster. As the publisher, editor, staff writer, social media manager (and everything else) I know you hear from me a lot. I’m glad to be doing a good enough job to keep you coming back (let me know if I miss the mark). My freelance plan remains the same in 2018, which is to make sure that people writing and telling stories here don’t just look like me. I’ll be happy to remain the only straight, white, able-bodied male on our contributors page. 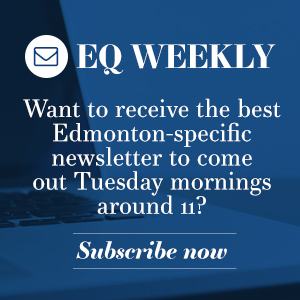 Shameless plug: If you want to put some money into our work, you’ll help grow the diversity of voices in Edmonton media. I’m even keeping up our special holiday offer for a few days if you are so inclined to become a supporter right now. With that deep freeze lifting, it’s the perfect time to look at some weather-related stories without wanting to flip a table of hot chocolates. With our first winter with actual, safe bike infrastructure, and a new salty brine being sprayed on thousands of kilometres of city streets and the new bike lanes, I figure our greatest challenge to winter accessibility is going to be exposed. Our sidewalk plan stinks. Depending on property owners to clear the sidewalks is a haphazard plan that makes too many stretches of neighbourhoods impassable for too many people too much of winter. It’s time to start considering that the City of Edmonton clear more of our sidewalks of snow and ice. It would at least make sense in our most walkable neighbourhoods, and near transit hubs. One of the biggest reasons to consider this is that we have way more people getting hurt here than in cities where the municipal government does the work. With data like that, it seems a bit uncaring to not consider a new way to keep sidewalks clear. That cold snap is uncomfortable for most of us, and potentially deadly to homeless Edmontonians. The crisis diversion team is always busy, but when the weather is as cold as it has been, the calls increase and the danger to those on the streets does too. If you can donate money, winter clothing or other shelter needs, this would be a fantastic time to help.